Description: The Lace Planter has a delicate appearance. It features short sennits of Square knots as well as areas without knots. This plant hanger design looks better with plant pots or bowls that are at least 10 inches wide. 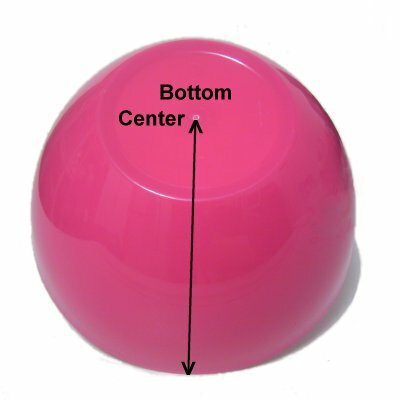 The cradle portion at the bottom can be adjusted for any height. 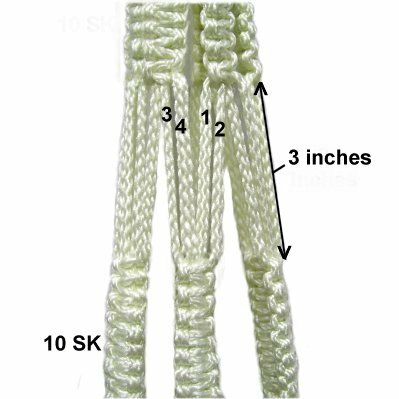 This Macrame pattern is easy to make, but fine tuning the position of the knots takes extra time. The finished size is approximately 50 inches, which includes the fringe at the bottom. 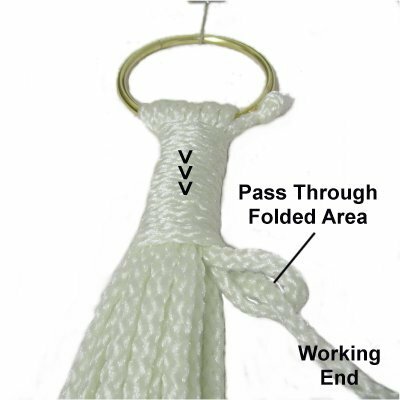 To lengthen this plant hanger, you can tie extra knots in the sennits, or increase the spacing between them. Make sure you cut the cords longer if you make adjustments to the size. Step 1: Cut 12 cords, each 6 yards long. Prepare the tips with masking tape to prevent unraveling. As you apply the tape, compress the end to make it as narrow as possible (for beading). Cut 2 cords, each 36 inches long (for Wrapped Knots). Step 2: Fold the 6-yard cords in half and position them over the bottom of the 2-inch ring, while holding the ring upright. Important: After you arrange each cord onto the ring, match the ends to center it. Then roll up the cord and secure it with a rubber band. Do this with every cord. Carefully place the mounted cords on your project board, as shown in the image below. The Wrapped Knot at the top of the Lace Planter is easier to make on a surface, so you can use pins. Secure a 36-inch cord to the right of the ring. Bring it down 3 inches, then fold it and move it back up. Secure it at the fold. 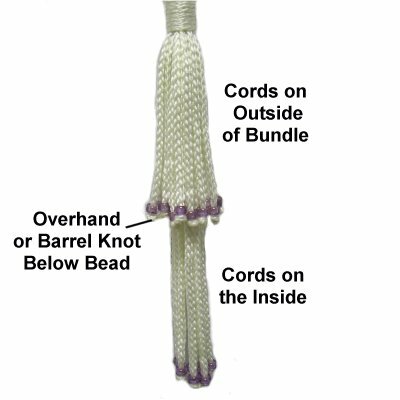 This cord is used to make the Wrapped knot, described below. Move the 36-inch cord (working end) to the left, over the front of ALL the cords. Bring it under all the cords, then back to the front. Wrap several more times, moving downward, until the knot is at least 1.5 inches long. Pass the working end through the folded area, which looks like a loop. Remove the pin from the secured end of the 36-inch cord. 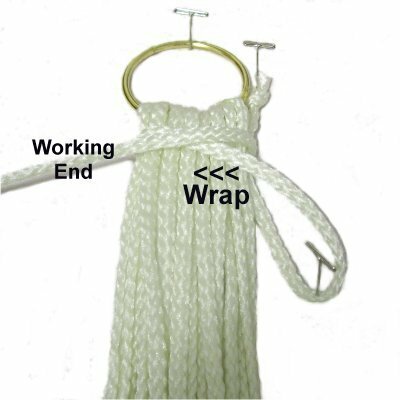 Pull it gradually, so the loop and working end move into the Wrapped Knot. 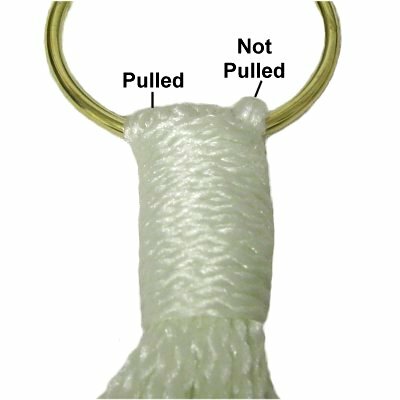 Stop pulling when the loop is about half way through the knot. 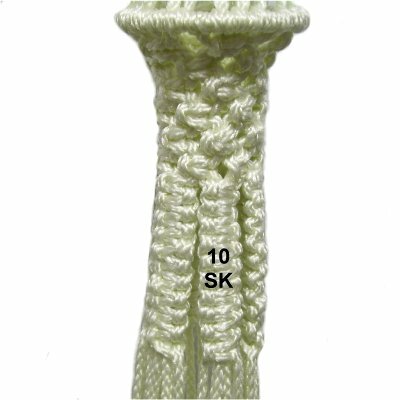 Cut off the two ends flush with the top and bottom of the knot. Use tweezers to push the stubs inside the wrapped portion. Step 3: Unroll each of the long cords and pull BOTH HALVES at the same time, so the cord tightens around the ring above the Wrapped Knot. This image shows most of the cords already done, but I left one so you could see how loose it would be if you did not pull the cords. Hang up the cords by the ring at the top. The remainder of the Lace Planter is easier to complete with the cords dangling. Step 4: Select one of the long cords and measure from the Wrapped Knot down 3.5 inches. Place a pin (or tape) horizontally, to mark that spot. Pass ALL the cords into the 2.5-inch ring, while holding it level with the floor (see next image). Find the marked cord, and attach it to the ring with a Double Half Hitch. 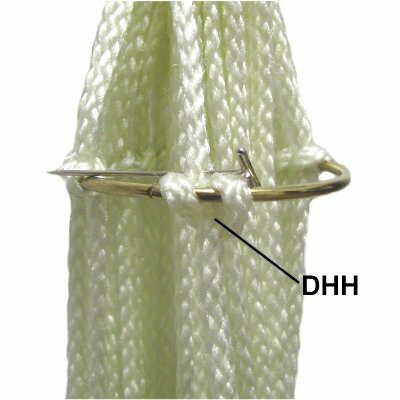 The pin should be as close to the ring as possible before you tighten the two Half Hitches (see image below). Step 5: Repeat step 4 with all the other cords, attaching them to the same ring one at a time. Measuring each cord is necessary to make sure the Lace Planter is level, so take your time and be accurate. When you are finished, you can add extra Half Hitches if the ring is not completely covered. Step 6: Tie 6 rows of Alternating Square Knots, placing the first row as close to the ring as possible. Each knot should have 2 working cords and 2 fillers. Make sure you tighten each knot firmly so they are close together. This will cause the top portion of the Lace Planter to curve inward slightly. Step 7: Divide the cords into 6 groups of 4 cords. With each group, tie a sennit of 10 Square Knots. Push them close together as you progress, so there are no gaps. Important: MEASURE each sennit to be sure they are the same length. You can make adjustments by pushing the knots closer together or moving them apart slightly. 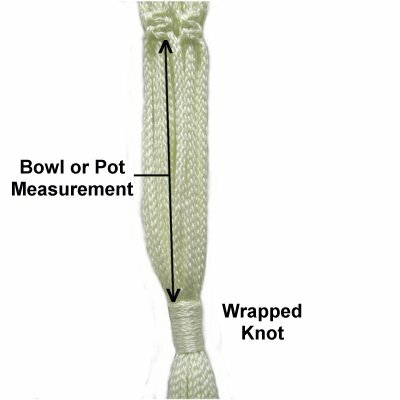 Measure from the top of the first knot to the bottom of the last. Step 8: Select two sennits that rest next to each other and mentally number the cords in each 1 - 4. Alternate by combining cords 3 - 4 from the sennit on your left, with 1 - 2 from the one on the right. Step 8, continued: Move down 3 inches, and tie another sennit with 10 SK. Hold the fillers while tightening each knot, so the tension in all four cords is the same. Push the knots close together, but be careful you don't change the position of the first knot. Step 9: Repeat step 8 with all the other sennits. Measure to make sure they are all 3 inches below the sennits made in step 7. Important: MEASURE each sennit and adjust them as needed, so they are all the same length. This is one of the most important parts to successfully making the Lace Planter, so measure carefully. Step 10: Repeat step 8, alternating the cords again. 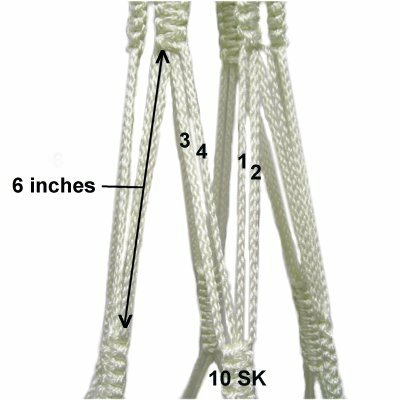 Move down 6 inches, then tie the SK sennit with 10 knots. Repeat with the remaining cords. Step 11: Create the next section for the Lace Planter by repeating step 8 (alternating the cords). 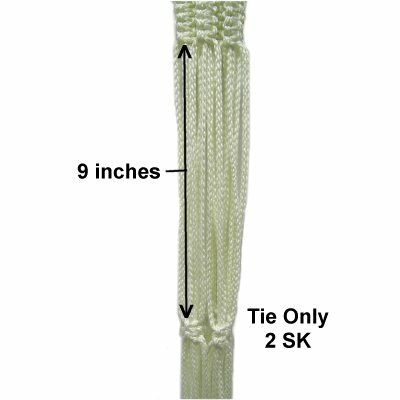 Move down 9 inches, and tie 2 SK. Repeat with all the remaining cords. Step 12: Measure the bowl or pot you plan to use in your Lace Planter. Start at the top edge, and bring the tape measure to the bottom center point. The cradle needs to be close to that measurement. Step 13: The cradle for the Lace Planter is the area between the two SK you tied in step 11, and the Wrapped Knot you will now tie. Organize all the cords so they are not twisted. They should dangle straight down from the SK. It helps if you arrange 3 groups in the front and 3 behind them. Move down the same distance as the pot measurement you got in step 12. 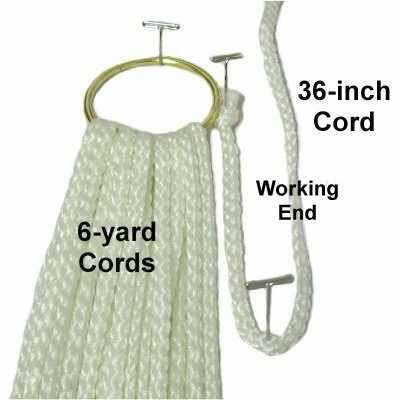 Tie a Wrapped Knot using the other 36-inch cord. It should be at least 1.5 inches long. Make sure you wrap firmly, so it's tight. Do not cut off the ends after it's tightened. Step 14: Place the pot or bowl inside the cradle. The bottom should rest against the Wrapped knot. 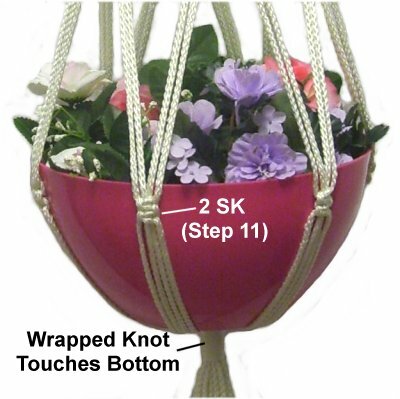 The two SK you tied in step 11 should be close to the upper edge of the pot or bowl. 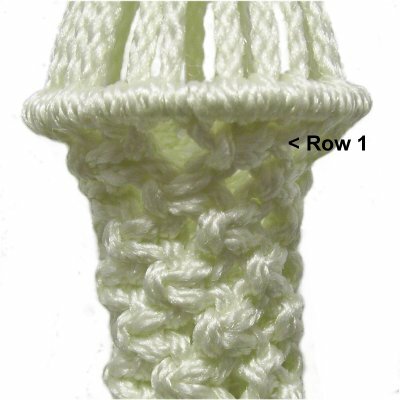 You can GENTLY slide the Wrapped Knot up or down as needed to obtain the best placement. Important: Do not pull the cords, or the cradle will become crooked. 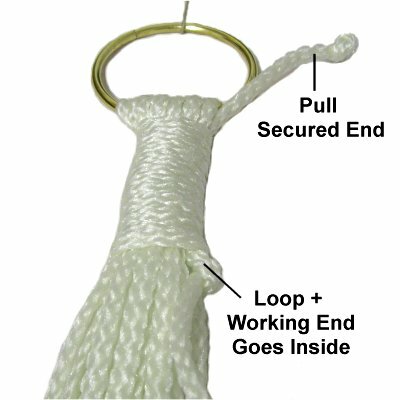 Once you like the fit, you can complete the Wrapped Knot by cutting off the ends flush with the top and bottom of the knot. Tuck the stubs inside the wrapped area. I recommend you complete the Lace Planter by creating a beaded fringe as described below. It's important that you do not pull the cords, or the cradle will become deformed. For that reason, a brushed fringe is not recommended. No matter what type of fringe you make, you need to finish off the cords in some manner to prevent unraveling. You can apply finishing knots, or paint the tips with glue or nail polish. When using Bonnie Braid or similar synthetic material, you can MELT the tips with a flame. Test the material first to make sure it does not BURN. Step 15: Take a look at the bundle of cords coming from the Wrapped Knot. Some are on the outside of the group and others on the inside. Mark the cords on the outside with tape, since they will be used for the short fringe, which you create first. 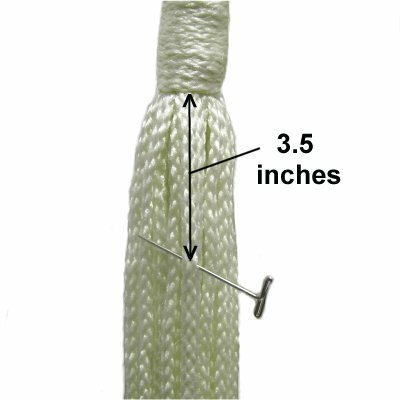 Step 15, continued: Measure one marked cord from the Wrapped knot down at least 4 inches. Slide a bead onto the cord, and tie either an Overhand or Barrel Knot below it. Be very careful when tightening, so you don't pull the cord downward too much. Repeat the same process with the remaining marked cords. By measuring each one, the beads should all be at the same level. Make adjustments if needed. Step 16: Now you make the long fringe with the remaining cords on the inside of the bundle. Measure one cord from the Wrapped Knot down at least 8 inches. Apply the bead, followed by the knot. Repeat with the other cords. Step 17: Once all the beads are on and where you want them, cut off the excess material. For Bonnie Braid or Nylon, you can melt the stub with a flame. Have any comments about the Lace Planter? Contact Me.